This Biodegradable Toothbrush has a handle made from 100% Corn Starch (Non GMO) and Dupont Nylon (Recyclable) bristles. It`s the first of its kind in the world, designed for children. Rounded Dupont bristles (SOFT) for superior cleaning. Ergonomic handle made from 100% Non GMO Corn Starch. Use minimum pressure and brush in a circular motion. 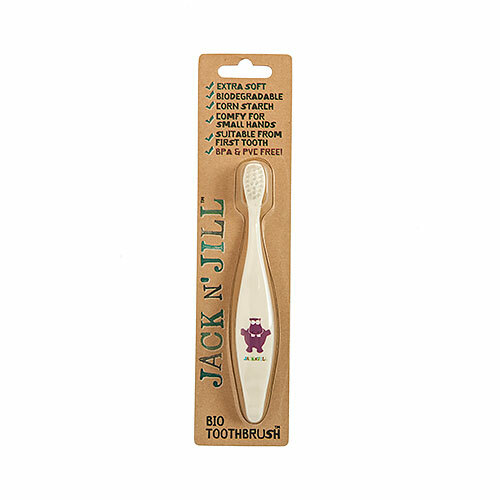 Use with Jack N` Jill natural toothpaste. Replace toothbrush every 6-8 weeks or earlier if worn. Replace after illness. Rinse thoroughly before & after use. Sterilise often. Allow bristles to air dry. Do not chew or bite. 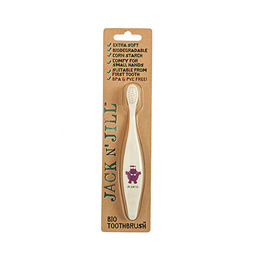 Below are reviews of Jack N` Jill Hippo Toothbrush Biodegradable by bodykind customers. If you have tried this product we'd love to hear what you think so please leave a review.